Children: Matilda had three sons by Geoffrey of Anjou. Her eldest son was Henry (later, King Henry II of England), her second son was Geoffrey, Count of Nantes and her youngest son was called William. 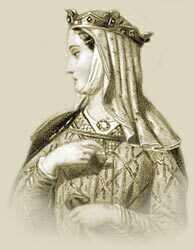 Death of Queen Matilda: Matilda died at Rouen in France. Buried in Rouen Cathedral; her epitaph reads: "Here lies the daughter, wife, and mother of Henry." King Henry I of England had two legitimate children. William and Matilda. William was killed during the White Ship disaster. The impact of White Ship disaster was that it left Henry with no male heir. Henry then called upon all his chief noblemen to swear that they would take her for their queen in England, and their duchess in Normandy, after his own death. Young Maude , her Latin name was Matilda, was married to the German Henry V, the Holy Roman Emperor. Her husband died in 1125 and Matilda returned to England. In 1127 she was forced to marry Geoffrey of Anjou. It was a tempestuous marriage, Matilda left her younger husband (he was 11 years her junior) but was reconciled and produced three sons. The eldest son was Henry, who was born on March 5, 1133 (later, King Henry II of England). Her second son was Geoffrey, Count of Nantes and her youngest son was called William. Matilda's father, King Henry I of England, died in 1135. Matilda was ready to take her place as Queen of England. Neither English nor Normans had ever been ruled by a woman, and Queen Matilda, the Empress Maude, as she called herself, was a proud, disagreeable, ill-tempered woman, whom nobody liked. The barons who had vowed to support the accession of Matilda to the throne reneged and Stephen, Matilda's cousin, seized the throne. Some of the barons and noblemen then turned on Stephen and invited Maude to come and be crowned in his stead. She came very willingly; and her uncle, King David of Scotland, set out with an army to fight for her; but all the English in the north came out to drive him back; and they beat him and his Scots at what they call the Battle of the Standard, because the English had a holy standard, which was kept in Durham Cathedral. Stephen was taken prisoner at a battle at Lincoln, and there was nothing to prevent Maude ( Matilda) from being queen but her own bad temper. She went to Winchester, and was there proclaimed; but she would not speak kindly or gently to the people; and when her friends entreated her to reply more kindly, she flew into a passion, and it is even said that she gave a box on the ear to her uncle, the King of Scotland, who had come to help her, for reproving her for her harsh answers. When Stephen's wife came to beg her to set him free, promising that he should go away beyond the seas, and never interfere with her again, she would not listen, and drove her away. But she soon found how foolish she had been. Stephen's friends would have been willing that he should give up trying to be king, but they could not leave him in prison for life; and so they went on fighting for him, while more and more of the English joined them, as they felt how bad and unkind a queen they had in the Empress. She was so proud and violent, that her husband would not come over to England to help her, but stayed to govern Normandy. She was soon in great distress, and had to flee from Winchester, riding through the midst of the enemy, and losing almost all her friends by the way as they were slain or made prisoners. Her best helper of all, the Earl Robert of Gloucester, was taken while guarding her; and she could only get to his town of Gloucester by lying down in a coffin, with holes for air, and being thus carried through all the country, where she had made everyone hate her. Stephen's wife offered to set the Earl free, if the other side would release her husband; and this exchange was brought about. Robert then went to Normandy, to fetch Maude's little son Henry, who was ten years old, leaving her, as he thought, safe in Oxford Castle; but no sooner was he gone than Stephen brought his army, and besieged the Castle, that is, he brought his men round it, tried to climb up the walls, or beat them down with heavy beams, and hindered any food from being brought in. Everything in the castle that could be eaten was gone; but Maude was determined not to fall into her enemy's hands. It was the depth of winter; the river below the walls was frozen over, and snow was on the ground. One night, Maude dressed herself and three of her knights all in white, and they were, one by one, let down by ropes from the walls. No one saw them in the snow. They crossed the river on the ice, walked a great part of the night, and at last came to Abingdon, where horses were waiting for them, and then they rode to Wallingford, where Maude met her little son. There was not much more fighting after this. Stephen kept all the eastern part of the kingdom, and Henry was brought up at Gloucester till his father sent for him, to take leave of him before going on a crusade. Geoffrey died during this crusade. Interesting facts and information with a short biography about the Medieval Life, Times and history of Queen Matilda. Additional useful details, facts, history, biography, timeline and information about the lives of all the Medieval Kings of England and the important events which occurred during their times, can be accessed via the Medieval Life and Times Sitemap. The content of this article on Medieval life and times provides free educational details, facts and information for reference and research for schools, colleges and homework for history courses and history coursework.